If there’s anything I’m the best at, in our company, it’s avoiding work! 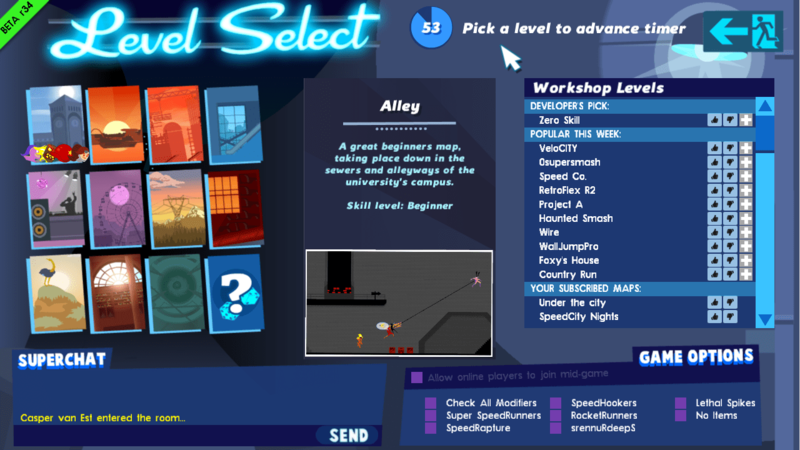 SpeedRunners is an Early Access game that updates with new features, levels and options every couple weeks. Development priority can shift around depending on how the audience responds, so we can’t predict exactly what the game will look like further down the line. The menu screens would sometimes collect features for months without a re-design, resulting in an intimidating wall of data and details for the audience. My task was to add space for five new levels. 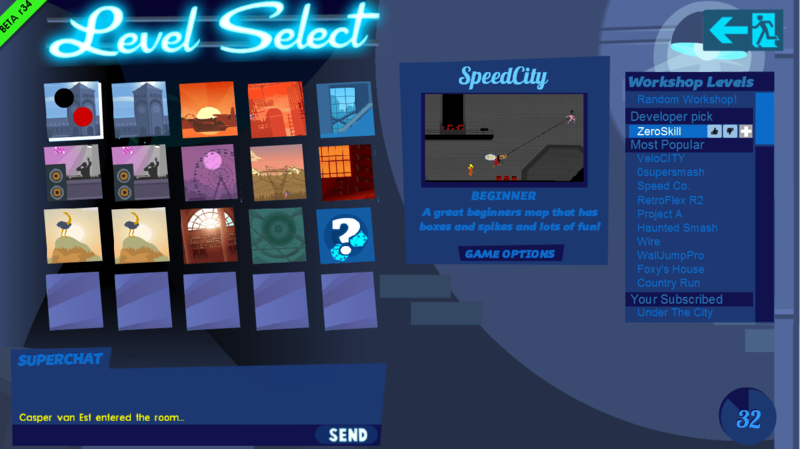 There was some anxiety from the team that things were too cluttered, and that this screen was overdue for a re-design. This would have meant meetings, new designs, new art assets and testing. Chop the colour palette down to 3 shades of blue, and white. Then rank each on-screen element in terms of priority to the audience, and assign colours that give low-priority assets much less contrast. The goal is to give the entire screen a more low-contrast, relaxed look, and highlight only the things that’re in a strict top percentile of importance. Does the title of the chat box need attention? No. Is a timer with 50 seconds remaining interesting to any player? It isn’t- so it’s given colours that are much closer together, achieving a lower contrast. Some assets added such little value that they weren’t worth the valuable space they took up: Labeling “Beginner” as a “Skill Level”, and explaining the mechanics of the timer are straight-forward examples. Anything that players were actively interacting with was given the highest priority, and the highest contrast in regards to the screen’s composition as a whole. The modifiers listed under GAME OPTIONS are only of interest to the host, and probably a veteran player at that. They were relegated to a rollout tab so they could be accessed by the 10% that’s using them without draining the mental bandwidth of the other 90%. With some critical thinking about how we use colours in regards to priority, the game’s menus were redesigned to feel much nicer in a couple hours, rather than a couple weeks! The lobby can still do with re-visiting down the line, but we were able to apply this huge improvement within the day and carry on with scheduled work.